There’s nothing worse than being woken up early by the bright sunlight streaming through your window. It seems like so many great things in life can be ruined by an unblocked windows or doors. Suddenly, we can’t do even the most mundane things in our own homes without fear of being watched or judged. We all need a good set of blinds, and bedroom blinds especially. The problem is that not all blinds are created equal. Some are sturdy enough to last years, and maybe even decades. Others can get bent just by someone pushing open two slats to look through. So, what are the best blinds and where can we find them? We’ll answer both those questions and more in the paragraphs below. You’ve probably seen blackout or blockout blinds before; blockout blinds tend to show up in domestic and office buildings where you pull the chain or cord and a solid layer of fabric or polyester comes down to cover the whole window. Anybody who prefers a darker room should look into them. If you’re the type who can’t sleep if any light is on, or you are very passionate about privacy or are secretly a vampire, blackout shades might be for you. Honeycomb blinds are blinds incorporating a multi-cell blanket of non woven fabric made of polyester fibre, with a headrail and bottom rail. It is an internal product, and is available as Sheer, Light filtering, Semi Opaque, Designer, fire retardant or Room Darkening fabric, depending on the cell size and application chosen. Honeycomb blinds can do more than change the look and feel of the room as they have excellent insulation properties with very low thermal transference, making them exceptionally energy efficient. They can also provide privacy while also letting in the level of light required. The layers are thin enough to allow light through but are still too thick to see through. Vertical blinds are just like their name implies. In these blinds, the slats hang down and are attached to a headrail or track at the top which allows them to be opened and closed with a childsafe wand or an old fashioned cordloop design. Vertical Blinds are able to provide privacy and light control by the ability to rotate the blades through 180 degrees, or set them at any angle in between, in addition to this, several draw options are available to suit a variety of window and door layouts presented within the home or office. In most cases, vertical blinds are used to cover large windows. For instance, if you live in a house with very large glass sliding doors, you might want to consider this type of blind as an option. A Zebra Blind is a double layered fabric blind that is available in light filtering, semi opaque or blockout fabrics combined with an alternating elegant sheer panel that is woven into the fabric, creating a striped or “Zebra” effect. The blind features two layers of striped fabric that roll off a single tube. One fabric layer rolls over the front of the tube and the other layer is anchored to the headrail. When operated by cord or chain, the front and back layers will go through sequences of overlapping as the blind is lowered or raised, once the full drop has been reached the overlap can be adjusted the desired level of privacy and/or light desired. The Zebra Blind is complemented by it’s stylish compact headrail with curved fascia in a range of colours, and is suitable for inside or outside mount applications. This feature in combination with the method of operating the Zebra blind results in it being one of the most versatile window coverings for privacy and light control. We know that the word curtain dates back to the 13th or 14th century, but curtains as a concept have been around much longer. Roman blinds, for instance, have been around since the Roman empire and were originally used to keep dirt away from windows instead of light. The Roman Blind can be made using light filter, sunscreen or blockout fabrics as well as the Louvolite collection fabrics, enabling it to suit all light and privacy requirements. Solar shades function much like blackout shades, and a third type known as roller shades are also similar. Which one you have depends on function and intent. All three types of shades work to block out a certain amount of light. However, roller and solar shades are not built to block out all light. Roller shades can be pulled down to cover the whole window and block out light, but they can be made from several materials which will all let different levels of light through. Solar shades also can be pulled down to cover the entire window, but they’re specifically built to block out UV light, but allow other types of light through. Using a Sunscreen fabric on your Roller Blind allows the ability to provide a transparent outlook that blocks out harsh heat and uv rays from the direct sunlight, without compromising your privacy through the day. Whether it be you have a view you dont want interrupted or just keeping an eye on the kids, this is a fabric worth taking a closer look at. 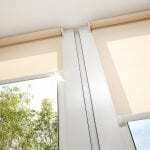 Although Sunscreen fabrics block harsh uv light and heat very well through the day, it’s only weakness would be that the privacy provided through the day is generally lost at night, which is fine for a lot of homes or offices where privacy of an evening is not a requirement for those particular rooms. By adding another blind to the opening or using a Duo Roller Blind the second blockout fabric is simply lowered at night for privacy and raised again in the morning. Last but not least, we come to this old classic. Venetian blinds are the technical name for the type of blind we all grew up seeing–the thin slats that are operated using a rod on one side and a pulley on the other. Venetian shades can be made of a lot of different materials. The most affordable material is plastic, and there’s nothing wrong with that if it works for you. However, the plastic is also easy to bend, so it may suffer at the hands of pets and children. 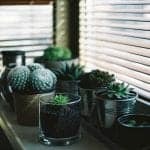 We could go on to mention the upsides of Venetian blinds, but they’re better outlined in this article. If you want to know more about window blinds, please visit our site. Ever wonder what type of blind suits a certain area of your home or office? For expert service and advice with a smile just book a no obligation free in home consultation with the team at Shutterup Blinds and Shutters today. We’re open Monday – Friday from 8:30am to 4:30pm. Yes, I want to receive home design tips, specials and VIP offers!